Meet Joseph. A new Salem resident but not new to Salem. 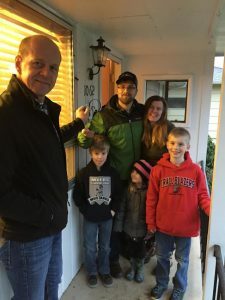 His goal was to be closer to family and to buy a property that needed far less “handles” than what he was currently using. He was not afraid of work, just didn’t want to do so much of it! We started off by introducing him to the various neighborhoods Salem has to offer. We looked at more houses than we can count and made several offers that did not stick, for one reason or another. During this time we realized that we were in the company of a true renaissance man. His life experience is so varied and he has done everything from working as a locksmith, electrical contractor, real estate principal broker to helping prepare telecommunications of a city to receive The President, to name a few. He is smart as a whip, witty, tender hearted and will not turn down an oatmeal raisin cookie. Salem already likes you, Joseph, and she will be better because you are here. Congratulations on your CONDO! We look forward to seeing the finished version. Also, we see some coffee & cookie dates in our future to keep in touch. Thank you for trusting us to work for you, for asking us hard questions that we had to dig and research and report back, to have only more questions posed for more digging and learning. Thank you for making us laugh! It is our pleasure to welcome you to Salem and we wish you the very best here. May your new home provide a place of peace & enjoyment for a very long time! 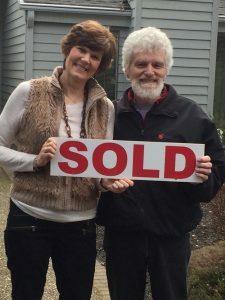 Last summer Doug & Nancy called us after getting our number from the For Sale sign at one of our listings. After meeting together, they decided to write an offer on the property. They were looking for a beautiful spot to build a house on, a place where they could eventually retire to, where Nancy could raise some small animals and Doug could do some serious stargazing. For a variety of reasons, that first offer did not work out. So, we started on an adventure with them that came to a close recently as they found some beautiful acreage to call their own. What starts out as a professional relationship changes at some point to one of professional & friendship and we feel so blessed by the people that we meet. When we walk away from the signing table we know we will miss hanging out and seeing our clients-turned-friends! But in our usual fashion, we’ve invited ourselves to see their completed build AND we know where Nancy works so we’re hopeful of keeping in touch! We wish you two the very best as your start your planning and building. May you create a place that welcomes you home each and every day! We so appreciate your business and thank you for letting us work for you. This doesn’t get old. This whole getting-families-into-homes thing. We met Michael & Miranda and their beautiful kids in September. We walked alongside them (literally) onto small farms, into vintage homes & a few with crazy layouts. 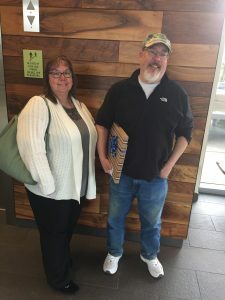 We learned that Miranda liked ranch style & was okay with “quirky.” She wanted to garden & they both wanted some space for their kids to run, as Michael grew up on acreage. Michael was not afraid of some DIY work either. We were so happy for them to get an accepted offer on a ranch style with a huge lot, lots of interior space and a nice workshop! 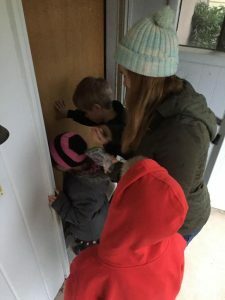 We gave them their keys over the weekend. This family will bless their neighborhood and the schools their kids attend. They will be an asset to our city. Welcome to Salem, Michael & Miranda. It’s been our joy & pleasure meeting you all! We hope you have many happy years in your new home. We thank you for your business! Welcome to the new johnandsandyvandyk.com — we’re glad to have you! Check back soon for more helpful content related to buying and selling your home in today’s confusing real estate market.